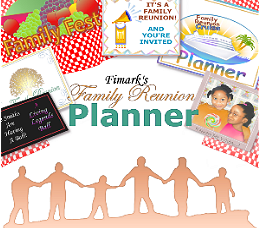 Family Reunion Planning Guides Apps and Books: The Family Reunion Planner Guide & Keepsake Book. The Family Reunion Planner Guide & Keepsake Book includes a timeline planner, checklists, budget list, themes and associated itineraries and dinner programs. The keepsake features include a signature of ownership page, an event details page, an event planning journal and a family recipe compiler complete with sections to record the history behind the family recipe. And it also includes one of Mark Angelo Askew's popular family reunion poems "Finding Our Way Home." The keepsake features include a signature of ownership page, an event details page, an event planning journal and a family recipe compiler complete with sections to record the history behind the family recipe. Other keepsake features include an heirloom record, family tree worksheets and other genealogy worksheets. Mark Angelo Askew, native born Marylander, artist and author promotes basic principles to strengthen the bonds through reunion planning, genealogical discovery, art and crafts, music and creation. Regarding the inspiration to write this particular book Mark says, "I've been married for over 30 years and have received five of the greatest gifts from this union. My wife, Brenda, two sons, daughter-in-law and granddaughter. I did not know such a joy existed. With so many opting not to marry, I wanted to do something that promotes the value of our most precious resource, the fully committed family. Nothing comes close to the deep impressions committed family life makes on our hearts and minds." Why this focus on commitment? Mark continues, "Deliberately choosing one another bespeaks validation, love and approval. Learning the secrets and pattern of natural endowments and the wise use of them leads to rewards that help us value life itself. It helps us put things in perspective, humbles us and with some guidance gives us an understanding of our core being no other experience can." The Family Reunion Planner Guide & Keepsake Book is not just a guide to help you plan, organize and manage your family reunion event. If you love unbreakable family bonds the activities are designed to strengthen them. If you love wisdom and hope the poetry is written to enhance it. If you appreciate a good read the dialogue takes you on a planning adventure. If you like inspiration the activity ideas will inspire you. If you thrive on order and direction the guidance will help. If you like fun and meaningful family reunions with lots of support you'll find out how to get it. If you like keepsakes and mementos the book itself is a keepsake complete with ownership page, journal and recipe book. If you like Fimark's Legendary Heritage Heirlooms collections the artist and creators are the authors of this book. . If you like getting big packages in the mail order the book. If you value family heirlooms this book is perfect as it includes genealogy record forms as well. If you like the poem, "Finding Our Way Back Home" by Mark Angelo Askew, you'll love it's in there too. Curious about what's inside? Take a look inside." Read up to 12 pages now and let us know if you like it here http://alturl.com/46jik and here http://goo.gl/MRoIz . The Family Reunion Planner Guide & Keepsake Book Makes a great personal keepsake heirloom and a valuable gift for dads, moms, genealogy buffs, reunion planners, family historians, family writers, committee members, family cooks, and the elders of the family.